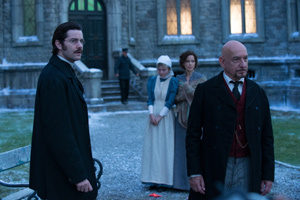 Stonehearst Asylum is loosely based on a short story by Edgar Allan Poe ( The System of Dr. Tarr and Professor Fether). Director Brad Anderson may have gotten the atmosphere right, but a too-conventional plot makes you wish the film had been more true to the brevity of Poe’s tale. We start with a brief introduction in an Edwardian medical lecture hall where Brendan Gleeson demonstrates the proper treatment of women with “hysteria” on his subject Elizabeth (Kate Beckinsale). We next meet Elizabeth in Stonehearst Asylum. Dr. Newgate (Jim Sturgess), fresh from Oxford, arrives at Stonehearst for a professional look-see. He rides the last leg of the trip with a poor grubby farmer who warns him against going. He arrives in front of the sharp iron gates at dusk in the midst of an eerie fog (naturally). He’s greeted by Finn (a suspicious-looking David Thewlis), the chief steward. “Welcome to our little madhouse in the wilderness,” he oozes. Newgate offers his letter of introduction to Dr. Salt (Ben Kingsley) who is eager to show the young doctor how things work at Stonehearst. Kingsley is perfect for the role, a blend of excitement and eccentricity, with something potentially unstable just below the surface. Salt is proud of their new techniques. The usual treatment of the insane is occasionally barbaric. Salt points out that the “insane” include only a few of the truly mad, plus homosexuals, “chronic masturbators,” and other eccentrics whose families just want rid of them. Newgate says he was taught that the insane are actually dangerous. Salt explains: “keep a man in his cage and he will behave like an animal.” He says that restoring a man’s dignity is often all that’s required for good behavior from the patients. It’s almost insightful, until you realize that real mental illness isn’t about people believing themselves to be teakettles or horses. With enough vagueness to mask any spoilers, I can say that Elizabeth makes such an impression on Newgate that he tries very hard to get her released. And Michael Caine turns up later as a sort of counterpart to Kingsley’s Dr. Salt. Though both Caine and Kingsley are in fine form, the formulaic plot makes their gravitas feel wasted rather than welcome. Director Brad Anderson is not what I’d call an auteur. He doesn’t have a signature style, and he usually directs films written by someone else. I think Stonehearst Asylum would have benefitted from someone a little bolder, a little more artistic, and a little less concerned with whether the film would play in Peoria. For example, the production design is almost entirely good — and that “almost” proves to be a big distraction. The biggest asterisk is the halo around Beckinsale’s Elizabeth, who gets a perfect coif of too-modern hair and eye-catching three-inch earrings. The rest of the inmates look like they smell of must and dust, but somehow our leading lady gets comes out smelling like fresh-cut roses. It’s too perfect, as though the filmmakers decided audiences were more interested in eye candy than immersion. That “too perfect” feeling permeates the film. The setting — a remote insane asylum, too far from the city for outside help. Our protagonist — a young educated doctor with no worldly experience. And the asylum itself — a place of dark candle-lit interiors, faded opulence, and the squalor of the more dangerous prisoners in the cellar. It all fits, but it might as well have been designed by popular vote. There’s no intriguing, singular vision; just a checklist of tropes. I shouldn’t be too hard, though. In spite of the formula, the production is competent. If you were motivated to check out Kingsley, Caine, or Anderson I wouldn’t turn you away. But frankly, I was hoping for more.